Racing isn't the only way to stoke your motivation. Here are seven alternative goals for the new year. 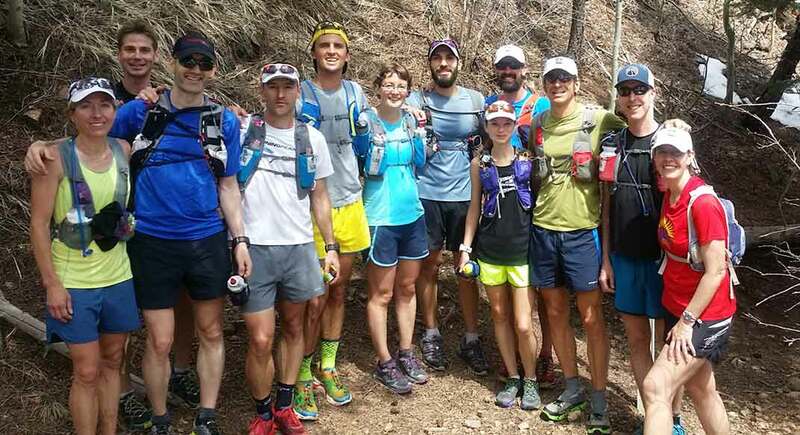 Clare Abram, center, at Jason Koop’s 2015 ultrarunning camp. Photo courtesy Clare Abram. I posed this question to many of my trail-running friends earlier this fall as we hung out volunteering at several Northern-California races. Invariably, their answers revolved around racing. Naturally, PRs or graduating to new distances are worthwhile trail-running goals—goals we all share. However, focusing solely on training and competing in races can dull a healthy and happy relationship with the sport. How about setting a different kind of goal—one that enhances your trail running yet doesn’t involve a typical race? Here are seven suggestions for alternative new-years goals that might enhance or refresh your trail time. This year, Stephanie Case, a Canadian ex-pat living in the Swiss Alps, set a goal to improve her orienteering skills. Nearly a year ago, Case suffered a life-threatening accident while running solo in the Alps, and had to be rescued by helicopter. “My accident taught me a hard lesson that I need to be better equipped if I’m going to do [unsupported days in the mountains],” she says. Other ways to better your wilderness skills include taking a Wilderness First Aid or Wilderness First Responder course such as those offered through the National Outdoor Leadership School (NOLS). 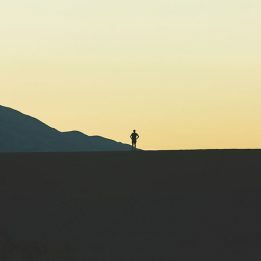 If you regularly drive from one place to another, can you connect those dots by running off road? Last September, Ian Robertson of Vancouver, British Columbia, cobbled together some trail routes from Vancouver to Squamish, a little over 50 miles. That got him thinking: Could he more than double the distance and run all the way up from Squamish to Whistler on trails, some 50 miles more? He plans to scout the best route in 2018 and make a go of it. Have you ever slept alone in the wilderness? “Some folks are completely comfortable with this, but I’d bet a night sleeping alone in the woods gives most folks the heebie jeebies. I know it does for me,” wrote Bryon Powell of iRunFar last October, before he embarked on a multiday solo adventure to explore the region around Bears Ears National Monument in Utah. Powell’s post prompted me to set a goal of camping alone in the coming year, on a night following a long trail run with fastpacking gear and food. I’ve always had friends or family with me while camping, for security and companionship. Being alone, and tuning into the wilderness environment overnight, sounds like a challenging yet enriching quest that’s long overdue. Jordan Smith of Woodbine, New Jersey, is branching out from running to kayaking, and he set a goal to try kayak camping in the new year—that is, to combine day-long kayaking with overnight camping and trail running. Allison Snyder, of Ophir, Colorado, plans to take winter off from trail running to develop her Nordic-ski skills, and to learn backcountry skiing and ice climbing. “After a winter of doing these activities, I’ll be very excited to put on my running shoes again!” she says. My multisport trail adventure involves our family’s purchase of a horse. Recently, I started hiking and running with the horse at my side, saddled up in case I want to take a break by getting on his back. My goal is to get both my horse and myself in better shape by sharing the trail together and to see how far we can go together in a day. I’m now more excited to hit familiar trails, which seem less familiar while covering the miles with my steed. When Clare Abram gained a spot in the 2015 Hardrock 100, she endeavored to prepare as well as possible by improving her high-altitude mountain-running skills. To that end, she gave herself the gift of attending coach Jason Koop’s Memorial Day Ultrarunning Training Camp in Colorado Springs. 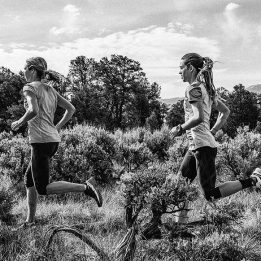 Numerous top-level trail runners host summer training camps, such as Timothy Olson and Jeff Browning and Krissy Moehl. Years ago, I relished attending an Alaska ultrarunning camp organized by former Ultra Runner of the Year Geoff Roes. More recently, I took a step toward fulfilling another goal: to run happier and more mindfully. I enrolled in a mindful-running retreat, hosted by former Trail Runner editor Elinor Fish. Fish’s company Run Wild Retreats aims to cultivate mindfulness, reduce stress and promote general wellness while running, and she hosts the retreats in gorgeous destinations, including Iceland, Spain, Italy, Ireland and Moab. If you can’t take the time or afford the price tag of a major trip, then you can do as I did and enroll in her virtual retreat, held through an online platform over eight weeks. Longtime trail runners often lament, “I’ve gotten so slow!” Exclusively running hilly, technical trails at a relatively slow pace can turn you into the fabled tortoise whose steadiness trumps speed. Training for a road marathon is a great way to regain speed, and to remember what you love about trails. Last spring, Blake Wood, 58, of Los Alamos, New Mexico, ran 2:58 at the Modesto Marathon—41 years after his first sub-three-hour marathon, making him the record-holder for the most years between sub-three-hour marathons. Wood, a Nolan’s 14 finisher and 21-time Hardrock 100 finisher, maintains his speed by coaching cross country and training with his daughter as she prepared for an Olympic Marathon Trials qualifying time. Apparently, “time to take a break” is relative, because in 2018 Dykes says he’ll shoot for the marathon record held by a 70-year-old male, 3:00:23, set by the late Ed Whitlock. The trail races we love could not exist without volunteers who staff aid stations, handle check-in, monitor traffic crossings and sweep the course. For the new year, consider making a commitment to volunteer at a trail event on a regular basis. Or, pitch in to help after you cross the finish line, as elite ultrarunner Michael Wardian did at the 2017 Hardrock 100. After finishing in 31 hours, he volunteered to serve breakfast to others at event headquarters. There are also numerous other volunteer opportunities beyond races. Eric Schranz, host of UltraRunnerPodcast.com, ran the California International Marathon in December to guide sight-impaired runner Kyle Robidoux. “Running as a sighted guide was probably the most significant experience I’ve ever had as a runner, and I can’t encourage you enough to get involved” through United In Stride, Schranz wrote in a post. I volunteer for a group called Running for a Better Oakland, which promotes healthier lifestyles and self-esteem by training lower-income Oakland-area youth for 5Ks or a half marathon. 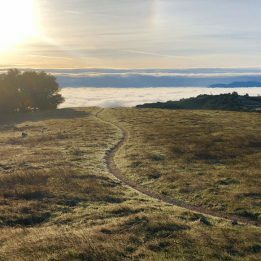 George Manning of Alameda, California, also volunteers with the group and uses the runs with the students as a warm-up or cool-down before or after his longer weekend trail run. Sarah Lavender Smith is a contributing editor for Trail Runner and author of The Trail Runner’s Companion: A Step-by-Step Guide to Trail Running and Racing, from 5Ks to Ultras.